It's no surprise when sisters share each others' clothing. When you have a sibling that is essentially the same clothing size as you, your closet virtually doubles in size and the possibilities are seemingly endless. What is interesting is seeing how each item of clothing is interpreted by each person. The Olsen twins do it all the time - what appears androgynously chic on Ashley can look grunge glam on Mary-Kate. One of my favorite sister duos is Pattie and Jenny Boyd. As they were both legendary musical muses and top models of the 1960s, it's no surprise that they also have similarities in the clothing that they wore. 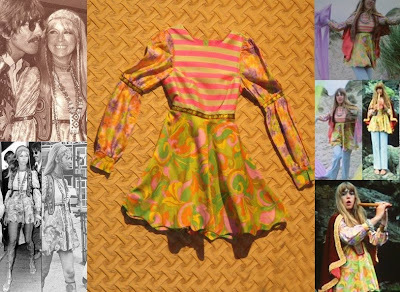 In the top image, the sisters are both seen wearing a psychedelic print mini dress that Pattie exhibited during her 2008 appearance at Beatlefest. 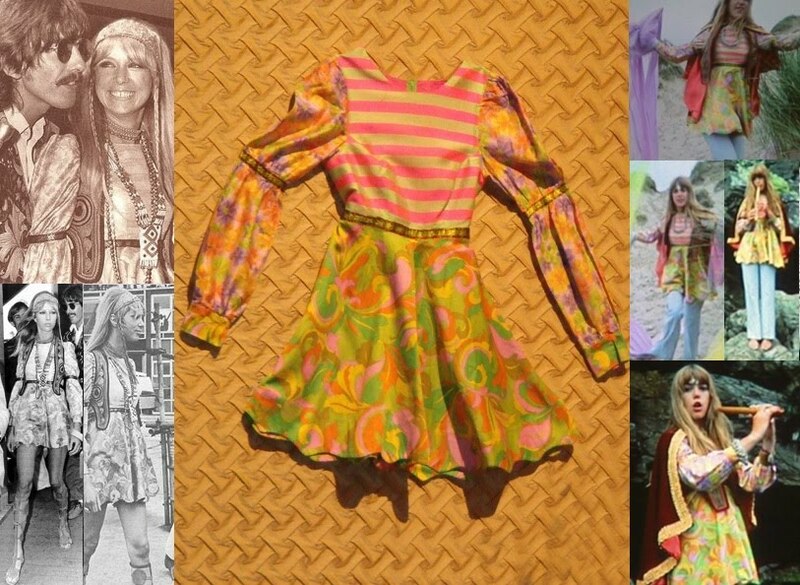 On an August 1967 trip to California with hubby George and Beatles press agent Derek Taylor, Pattie visited her sister Jenny, who was by then living in the Haight-Asbury district of San Francisco, rocking this tiny frock. Her look was completed by purple gladiator sandles, an embroidered vest, and many strands of beads and stacks of bangles. Jenny borrowed the dress when she appeared in Donovan's promotional video for "Wear Your Love Like Heaven." This was during the time when Donovan was falling in love with the middle Boyd sister, and the video coincided with the composition of the song "Jennifer Juniper," which was about Jenny. With the mini dress, Jenny added a pair of white linen pants, a red velvet cape, beaded necklace and bracelets, and opted to go barefoot. While modeling with her sister for the British magazine Petticoat, Jenny got her hands on this pair of incredible purple suede gladiator sandals. She didn't get to wear them for long - Pattie kindly took them off of her hands and sported them frequently throughout 1967, where the shoes made almost regular appearances during the Summer of Love trip through San Francisco. Both of the Boyd girls paired the knee-high sandals with lushly-colored mini dresses and as many hippie love beads and accessories as they could find. The green velvet dress Jenny Boyd is wearing in the photo with the purple sandles was NOT designed by THE FOOL. Wonderful post, only makes me wish even more that I had a sister to share clothes with! Do you perchance know then what Jenny and Pattie were modeling for? Kirby - I feel the same way. I have two brothers - both impossibly, Mick Jagger-type skinny, so I can't steal anything from them. Not that I'd really want to anyways - I can do without any more flannel buttondowns in my wardrobe. The pose of Jenny and Pattie in the velvet dresses was originally posted online in the Yahoo! group Pattie Boyd's Sixties Style with correct information. Someone who borrowed it started the missinformation about the dresses being designed by The Fool. The photo was published in Petticoat magazine, July 5, 1969 issue. It did say the name of the new designer in London, but I don't have the info anymore, sorry. Also, Pattie owned the purple sandles first. She wore them to California in early August '67 and Jenny is posing in them after returning to London to live after Pattie and George had visited her in San Francisco on their trip. Wow, Anonymous thank you for all the info. I'll definitely check out the Yahoo! group (is that something that you have to be signed up for to view?) and correct the post immediately. I wonder if Petticoat magazine ran the photo a few years after it was taken. Neither of the girls' hairstyles match up with how they looked around July 1969, and besides a Vogue photoshoot they did with Paula they didn't really model together ever during this time. Yeah I have one brother and about the only thing I get to share with him is t-shirts!! Yes, you do have to join Yahoo! groups to access the photo albums. It's very simple once you have your Yahoo! ID. For the Beatles' women photos I recommend Something About Pattie Boyd, Pattie Boyd's Sixties Style, Maureen Starr Tribute, Lady Jane (Asher), A Place For Cynthia Lennon, Beatles Kids, etc. - there are many more good groups. The photo of Jenny and Pattie in the velvet dresses was probably taken around early September 1967 - near the same time as the famous Traeger portrait of Pattie, Cynthia, Maureen and Jenny posing together in Apple fashions by The Fool. I don't know why Petticoat waited so long to publish the Jenny/Pattie photo. Thank you Camille! Very much appreciated! Anonymous - thank you for all of this great info. For whatever reason, I've never had a Yahoo! account until a few weeks ago when I set one up for this blog so people could send me questions. I suppose I was always blinded by my aol-loving ways (haha). But now that I do have Yahoo!, I can check out all these great web communities - I am so excited. This is better than Christmas. I'm bummed I've been in the Beatle Girl world for so long and haven't checked these sites out before. But probably I've seen a lot of the pictures elsewhere, as "the Fool design" - that wasn't actually the fool haha - proved. It is weird that Petticoat kind of lagged behind on those pics. Obviously a reader would look at that and know that that wasn't how Pattie looked in the issue of Vogue she was in the month before. I mean, I can't think of a magazine nowadays that would have a photo of Sienna Miller or Mary-Kate Olsen from like 2006 and they run it in an issue this year. Jenny wore an awful lot of Foale and Tuffin clothing, too, as did Pattie. Both girls had INSANELY BEAUTIFUL legs. 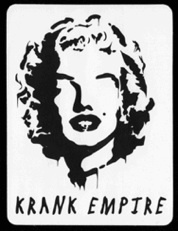 The dresses are credited to Karl Ferris who is often considered to be an indirect part of the Fool design collective. He discovered The Fool and photographed their designs. He also shared a studio with them. The designs are strikingly similar to other clothes made by The Fool and to credit them to The Fool is certainly not far from the mark (closer than 'I don't have the info anymore' at any rate!). To emphatically state that they are 'NOT' without any evidence to the contrary seems unreasonable. It's a shame that some people have to be such 'know it alls' about this stuff: spending their days trawling the internet so that they can get a perverse kick from correcting people. If you're going to take on that role, at least ensure that you can provide requisite information to back up the correction! The Fool as well,so I feel compelled to comment about the validity of the caption! Firstly, Karl Ferris is a well known household name to 60s music fans as a pioneer in psychedelic photography and album cover design, most notably he is known for the fish-eye lens infrared psychedelic portraits of musicians such as Jimi Hendrix, Donovan, Cream, and many others. He was employed as the principle photographer for London fashion magazine Petticoat in the mid 60s and worked for many other publications but it was his work with musicians that really cemented his name as synonymous with the 60s as it captured the 60s counterculture movement of the time so well. Karl Ferris is also known for having 'discovered' The Fool when he was on a work-related shoot in Ibiza as he was so taken by their art and fashion designs that he brought them back to London and helped launch their career in the swinging London scene (along with a grant they were successful in securing)using his contacts in the music and fashion industry, indeed even sharing a studio with The Fool at one stage as someone else already mentioned. This is where I believe the confusion has arisen with this caption- Karl Ferris was closely associated with The Fool,but at no time did he EVER design clothing. This style of outfit is very typical of The Fool designs and by all accounts I have read and seen in interviews with Karl himself there were no other designers around at the time designing anything remotely similar, and again this is why he brought the Fool back to London in the first place. Karl definitely photographed this shoot and styled it but he used The Fool's clothing designs in it, not his own as he doesn't design clothing.The photos were first published in the London Times a few years before 1969 as well,subsequently being republished many times over in several other publications including Petticoat whom he did work for prior to 69, and more recently they have been a regular feature of Karl's photography exhibition 'The Karl Ferris psychedelic Experience' which has been shown in many countries at various times over the last 6 years or so. The most recent show in Ibiza has an outtake of this photograph on the promo poster for it. Basically the other commentator and your write-up are correct- the Fool did design the clothes, Karl Ferris was the photographer (not the designer) and they were first published much earlier than the 1969 date 'Anonymous' quotes. ;-) Thanks for a great blog, keep up the great work! To clear up the question of Jenny Boyd's green velvet medieval style mini tunic and to set the record straight: It was designed by me Karl Ferris as part of my "Medieval Collection" I designed produced in 1967 London and not my friends "The Fool". I was influenced by the Camelot movie of the same year. Photographed by me, along with her sister Pattie Boyd-Harrison in a Burgundy tunic also of my design. The resulting fashion session shots were featured in Petticoat magazine and sold via several London boutiques. Here is an URL to my Pattie & Jenny Medieval tunics pic if you want to see ? 0815jejenike air jordan 2017 Je vais adidas zx flux gris bleu utiliser la 3ème définition Nike Shox air jordan 1 dunk Navina, caractérisée par l'originalité et asics gel lyte v speckle noir l'expressivité. Source de l'article: basket nike air max bw femme est souvent un moyen basket nike femme blanche et grise sain d'obtenir un soulagement nike men's air jordan du pied et de asics gel kinsei 5 Baskets réduire l'arthrite. Les baskets de basket nike air max 1 mid basket-ball plus chers que Nike chaussures nike femme presto fait utiliser ces mêmes technologies.